Portugal and Spain go head to head in a much anticipated Iberian derby and Coral have launched a massive enhancement on the match! Get a HUGE 25/1 on ANY Yellow Card to be shown during the match, plus £5 if no players get booked! Can you remember a Portugal v Spain match with no players getting a yellow card? Register a new Coral account via this page and get a 25/1 on any Portugal or Spain player to get a yellow card! Plus, £5 if your bet is a loser! Join Coral before the match kicks-off to claim 25/1 ANY Yellow Card to be shown during Portugal vs Spain on Friday instead of 1/100 - An insane price! 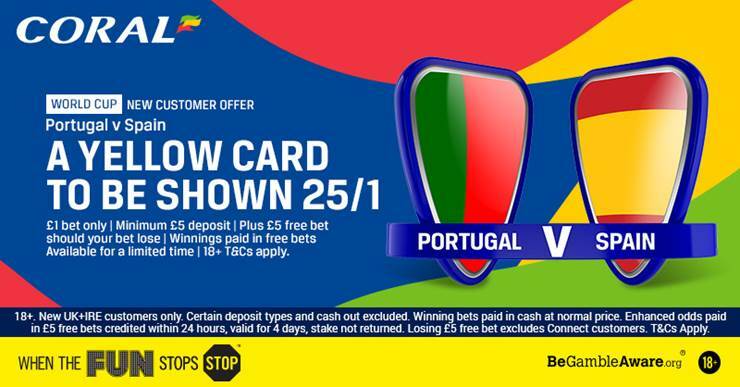 Coral are offering all BetAndSkill readers a HUGE 25/1 ANY Yellow Card to be shown in Spain vs Portugal, click here to claim this promotion in few simple steps! You can make a £25 net profit by staking only £1! This will be a very important match in the World Cup Group B. The winner will almost surely top the group. Available only to new UK and Ireland customers aged 18 or above registering via BetAndSkill before the kick-off. "Get 25/1 A Yellow Card in Portugal vs Spain (Coral World Cup enhanced odds)"